Happy New Year from Yalla Y'all! Things are picking up again in January in the metro Atlanta/north Georgia raqs community. If your resolutions include getting out to participate in more workshops or see more shows, get ready for some fun events this month! The SEEDs program is changing lives for girls all over America, and now there's a group for intown Atlanta: Lotus SEEDs. To ensure that every girl who wants to participate can get involved, regardless of her family's ability to pay, Lotus SEEDs is running a crowdfunding campaign in partnership with C4 Atlanta, a non-profit arts service organization. January 5 is the closing day of this campaign, so don't miss your chance to help build this program! Click here to learn more. Yes, there's more to Perry than just the Georgia state fair. The ladies of Perry Belly Dance, led by Trichelle Hutton, invite you to check out their latest class schedule, meet their instructors, and enjoy dance demonstrations and light refreshments at this open house. Specials on classes will be offered, as well as a drawing for a free eight-week session. Visit the Facebook event for more details. Check out a free mini-class at 2:00, plus a big sale on merchandise, performance demonstrations, refreshments, and more at the original Nazeem Allayl location in Candler Park. The inaugural Tribal Cafe in December was a huge success! This month's guests include Jules Downum (formerly of Heather Stants' Urban Tribal) and Tribe Zanzibar of Chattanooga; local favorites the Salimpour Collective; and members of Awalim Dance Company. Enjoy tasty Iraqi food and talented performers in a unique lunchtime setting. Babylon Cafe is opening early for the event, and they are prepared to welcome a full house. Click here to pre-order tickets. RSVP to the Facebook event for all the latest information. Hone your skills in a series of workshops with world-renowned instructor and performer Suhaila! 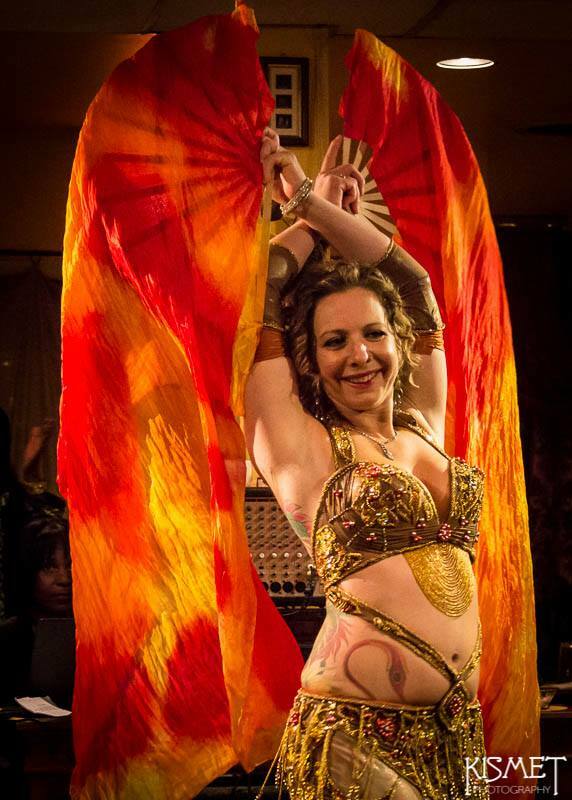 Atlanta Fusion Bellydance welcomes her back to Atlanta for six days of workshops, including classes in the Jamila Salimpour format as well as Level 2 Suhaila format certification. There will also be a recital at AFBD Sunday evening. Visit the Facebook event for more information. Click here to pre-register for workshops or buy recital tickets. Optional Suhaila Level 2 certification testing is available for additional fee of $250. Learn how to perform graceful, tasteful, captivating floorwork with one of metro Atlanta's most talented American Cabaret-style performers. Check out the Facebook event for more details; click here for advance tickets. Happy holidays from Yalla Y'all! However you celebrate, enjoy the best the season has to offer. And what's better than sharing good times with your dance family?!? Don't miss these great events coming your way in December. 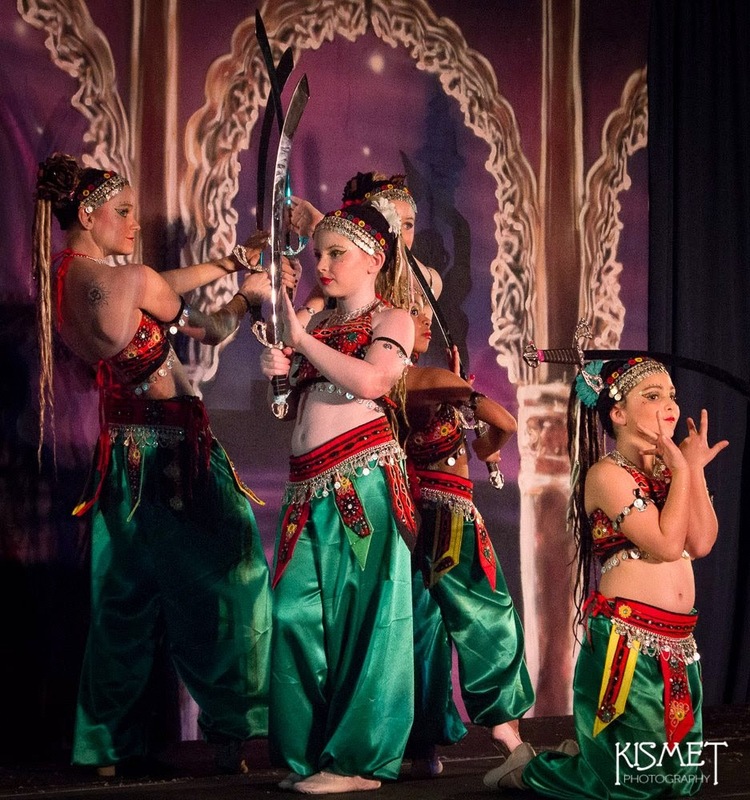 Ziah and the Tribal Belly Dance Center of Atlanta will launch their new Lotus SEEDs program for girls 5-17 while also welcoming dancers and students who want to check out the studio and the classes offered there. Free demo classes for kids at 10:00, 11:00, and noon; adult demo class at 1:00. RSVP to the Facebook event for more info. 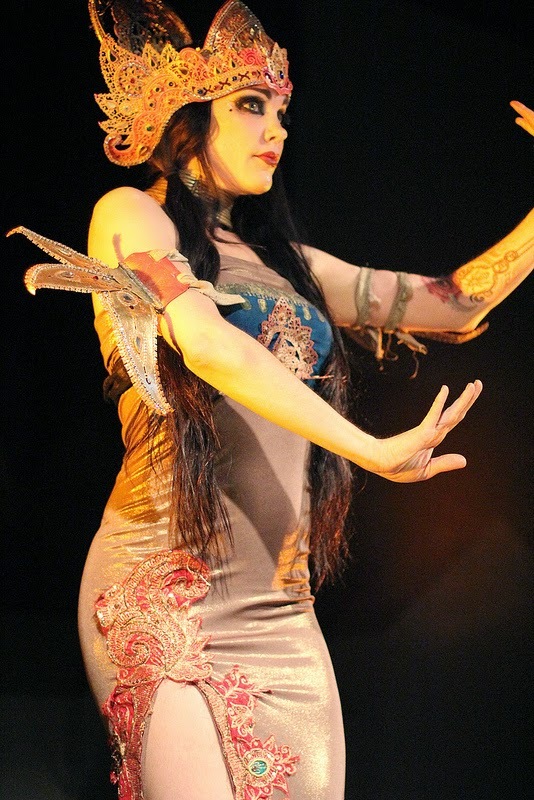 Headdresses have become an essential component of costuming for all belly dance styles. Learn two different headdress types that you can embellish in any way you choose! Ziah will teach both styles; follow along with both or work on your own project. Visit the Facebook event for more details and a materials list. Click here to pre-register. Workshop 1:00 - 3:00 p.m.
Hafla 6:00 - 8:00 p.m.
Join Vany for an intensive study of her trademark "DTTS" format. Learn how to use your 25-yard skirt for graceful combinations that can enhance solo or group performances. Bring two skirts, or skirts will be available for rental. Visit the Facebook event for more details. Click here to pre-register. Experience the debut of a new monthly event featuring local and national Tribal style performers! This month's special guests will include Mavi, creator of the Tribal Cafe in Washington, DC. (which has been running for ten years); two members of the New York City-based Tribal Fusion troupe Maiden China, Lauren Jeanette and Mattie Waters; and members of the Awalim Repertory Dance Company. There will also be an ATS jam for anyone who knows the vocabulary and wants to participate. Enjoy some delicious food and great performances in a cozy atmosphere! Click here to purchase tickets. RSVP to the Facebook event for more info. Talented performers from the Athens raqs scene and beyond take the stage at this legendary venue (okay, it's moved a few times over the years). Enjoy performances by instructors and students from UGA's Ramsey Center and the troupes Inti'sam, Harraka Thar, and Zuhairah from the Healing Arts Centre, as well as some surprise guests! Visit the Facebook event for more details. Doors at 5:15 p.m.; show at 6:00 p.m.
Join Atlanta Fusion Belly Dance, World Belly Dance Alliance, Nicola, and of course pretty much everyone in the metro Atlanta belly dance community (and beyond) for an evening of dance, food, and fellowship. Click here to buy advance tickets, or check out the Facebook event. November will be a pretty quiet month in our local raqs community. Enjoy the quiet but check out these events! 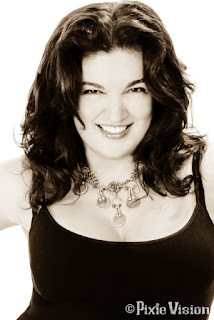 Learn an exciting new choreography with Aziza Nawal! One you learn this number, you'll have an Click here to pre-register. RSVP to the Facebook event for more info! opportunity to perform it in the "AFBD's Got Talent" show on December 13. This choreography is designed for intermediate to advanced dancers. Nazeem Allayl presents its annual fall studio show, with performances by instructors, troupes, and students. Click here to select your seats! 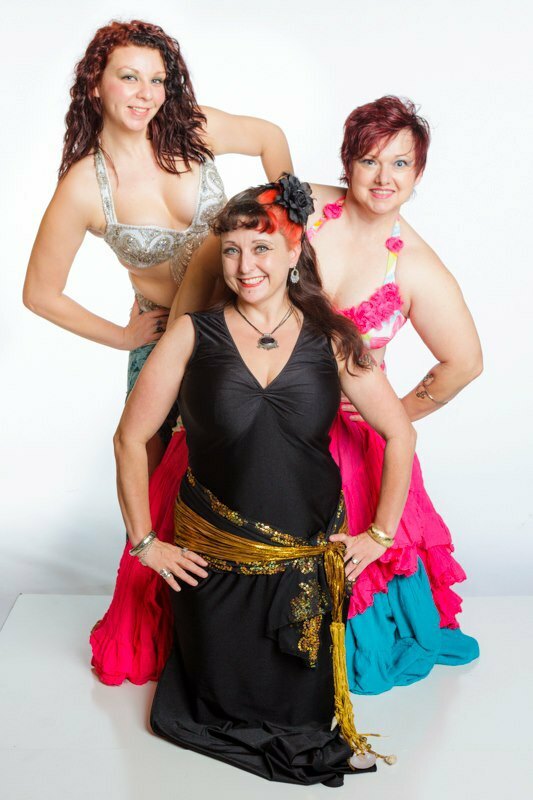 Brought to us by local dancers Kalinka and Maiea and sponsored by Miss Belly Dance, this weekend includes three classes with Lulu Sabongi of Brazil and two with rising star Chudney Raks of Virginia Beach (you may have seen Chudney perform at this year's Essence of Belly Dance). There will also be a show featuring the instructors and local talent, Friday, November 13 at 8:00 at Imperial Fez. Ticket price includes a five-course Moroccan meal (alcoholic beverages and tip not included). Visit the web site to register, or RSVP to the Facebook event for the latest news. Get out there and enjoy some spooky fun this October! Kick off the Halloween season with Mina and lots of local talent in Oakhurst. Visit the Facebook event to learn more. If you saw Lavesh perform with Kaitlyn at TribalCon in February, you know what an amazing performer he is. He's also the creator of the Learn Bhangra app. Learn the basics of Bhangra or delve deeper into this energetic style of Indian dance in a series of workshops. Plus, catch performances by Lavesh, the ladies of Glow, and many others at the show Saturday night! RSVP to the Facebook event for all the latest news; click here to get tickets. 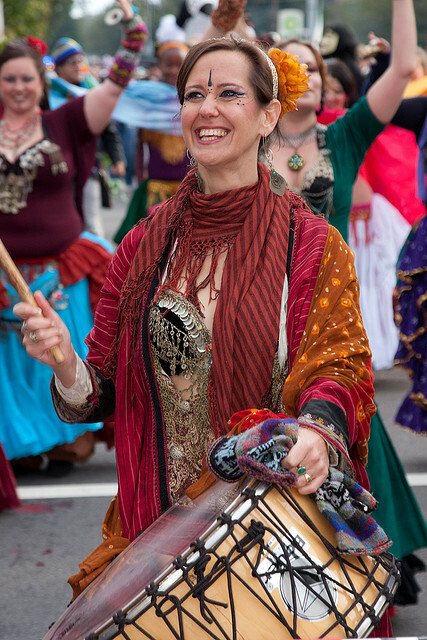 Show, Saturday at 8:00 p.m.
Little Five Points neighborhood, 4:00 p.m.
Once again, Awalim Dance Company will bring music and dance to the infamous Little Five Points Halloween Parade. Check out the parade and the colorful neighborhood festival! Learn more at the Facebook event. Awalim brings back its spooky and/or silly celebration of Halloween! Enjoy performances by the Awalim Repertory Dance company, along with many of your local favorites. Check out the Facebook event for more information (or if you'd like to perform)! Click here for tickets. 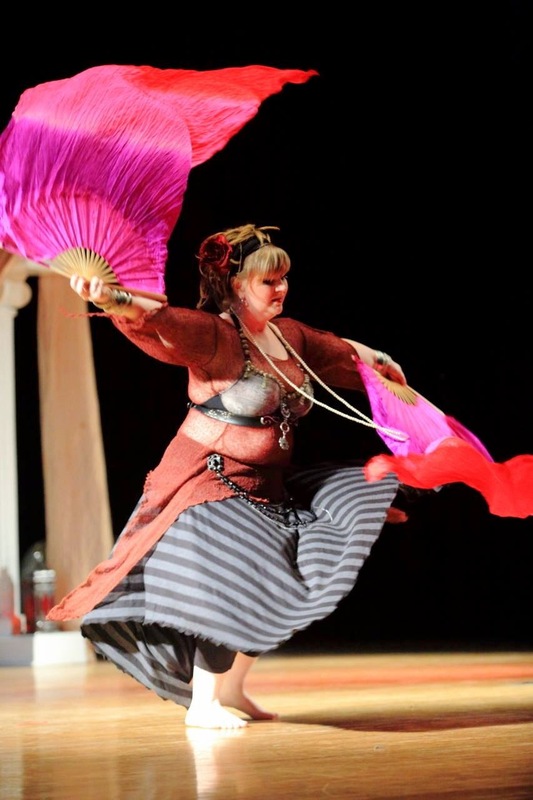 Known for her gorgeous costuming and as a leader in Gothic-style belly dance, Tempest comes to Athens for one evening to share her secrets in a workshop billed as "THE Introduction to the Art of Gothic Bellydance." RSVP to the Facebook event for more details. 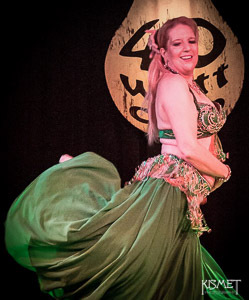 Join Vany and the Augusta-area belly dance community for their annual Halloween Hafla. More details to come on the Facebook event. Join the Athens raqs community at the annual Wild Rumpus parade and Halloween festival in downtown Athens. This year's theme is "MONSTER." Athens, I love you crazy, just keep on! Check out the Facebook event for the full schedule. September is mostly about Essence of Belly Dance, an annual festival that will be celebrating its sixth year. There are lots of workshops, shows, shopping, a fashion show, and a competition... so come out and enjoy Essence! Then join your local favorites at Steve's Live Music on the 25th. of Cairo, Petite Jamilla, Aziza Nawal, Leila Farid, and drummer Issam Houshan. Enjoy performances by all of them, plus local and regional talent (some of whom will be competing for cash prizes), in shows Thursday, Friday, and Saturday nights. Visit the Essence web site for full details, and be sure to RSVP to the Facebook event for the latest news. Join Jenny Nichols in welcoming lots of local talent in an informal setting. The dog days of summer have arrived in metro Atlanta... and the raqs event calendar is heating up in August with some unconventional guest instructors and performers. Put some variety in your dance with these workshops and shows! 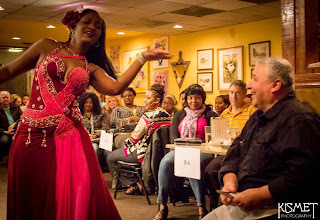 One of the most prominent male belly dancers on the East Coast, Miami's Andrus Ramir is an audience favorite wherever he goes. He'll be teaching three workshops and performing Sunday night with other local and regional favorites at Steve's Live Music. Visit the Facebook event for the workshops or the show for more details. Click here to get your workshop pass; click here to buy advance show tickets via PayPal. If you caught Ebony's classes or performances here last June, you know that she's quite amazing. 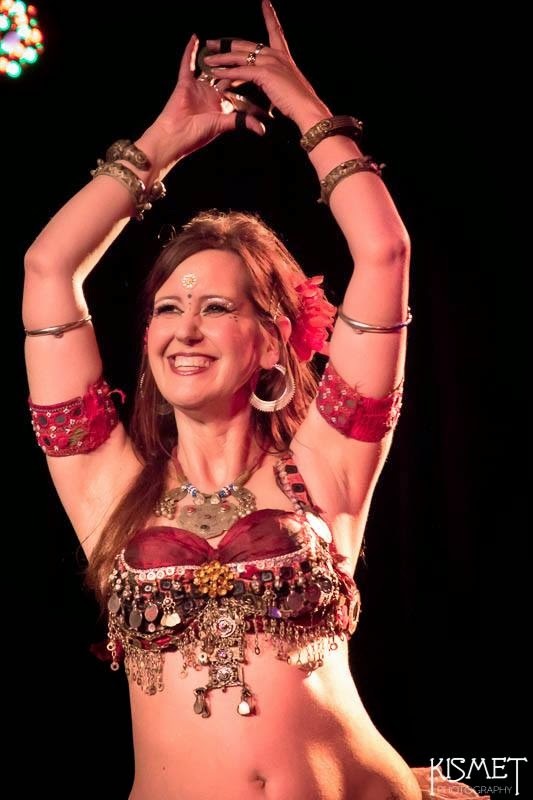 She returns this summer for three workshops, including a two-part class in which she'll teach a choreography to be performed at Essence of Belly Dance in September. Visit the Facebook event for the latest details. Join AFBD for a cookout and get-together with performances by AFBD students, instructors, and special guest Ebony Qualls. Shop while you shimmy or sell some of your stuff! Visit the web site for more details. A reception at 6:00 will be followed by performances from troupes Nazeem Allayl, Nazeem Almassah, and Nazeem Alsabah. Check the web site for more information. Once again, Yvonne will visit from Florida to teach the Salimpour format to newbies and veterans alike. Visit the web site for more details and reserve your spot. Okay, raqs enthusiasts, get ready for a very busy month! There are lots of cool events coming up in metro Atlanta this June... get out there and support our vibrant dance community. What Tribal belly dancer doesn't have a box of coins, buttons, and other "bits" waiting to adorn a jingly belt? Bring all that stuff to the Tribal Bellydance Center of Atlanta! Learn how to decorate a Tribal belt and how to make Tribal belt decorations that are flexible and interchangeable. Check out the Facebook event for more information, including a materials list; click here to pre-register. Join Amani and many of North Georgia's most talented performers as they perform to the music of the Atlanta Phoenicians Group and Jonatan Derbaq. This is going to be a fabulous show (full disclosure; I'll be performing)! Visit the Facebook event for more details. Hope to see you there! Atlanta SEEDs Annual Fundraiser, "From East to West"
Come out and support the good work done by Zaia and Liezel at Global Dance to benefit girls in theirFacebook event for more info; click here to buy advance tickets. 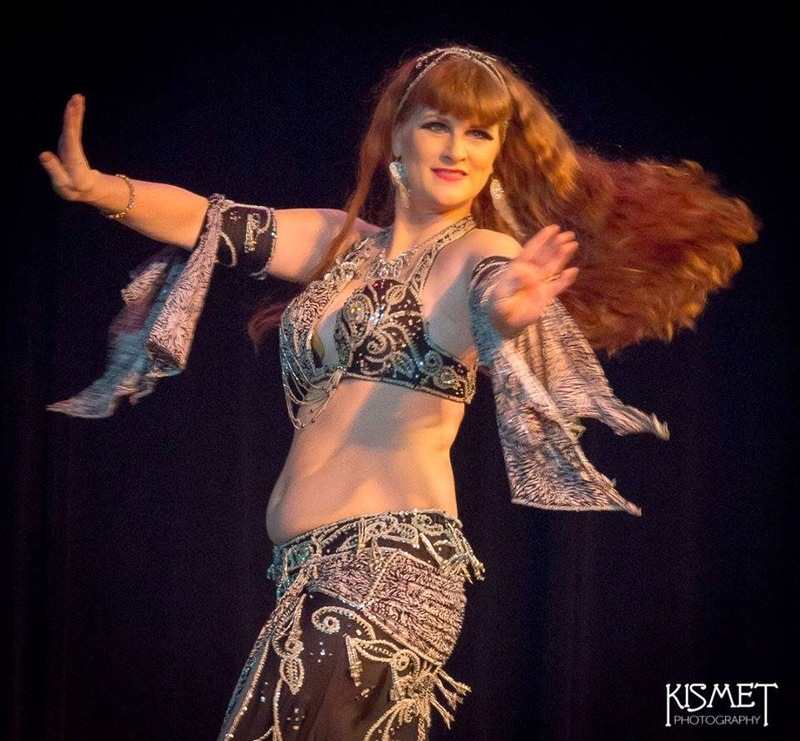 Gain confidence with self-defense skills you can use, taught by one of metro Atlanta's most badass belly dancers, Victoria Logan (aka Inara). Victoria has extensive experience in several martial arts disciplines, including Taekwondo (Black Belt), Krav Maga, and Jiujitsu. Some of the most innovative performers in the raqs world have roots in modern dance. In this five-part movement exploration series, Heidi will share her own unique blend of Horton, Graham, and Dunham technique. Click here for more information and payment options, or visit the Facebook event. Celebrate the anniversaries of three metro Atlanta raqs institutions, with great food, good company -- and of course lots of dancing! Visit the Facebook event for more info; click here to buy tickets. Join Jenny Nichols and World Belly Dance Alliance for another fun night at a great venue! Expect performances by lots of local favorites, plus special guest Naima Sultana of Charlotte, NC, who will be teaching a workshop the next day. RSVP to the Facebook event for all the latest news. Fresh off an Eastern European tour with Belly Dance Evolution, Charlotte's Naima Sultana brings a special three-hour, multi-level workshop to metro Atlanta. "Helwa" means "beautiful" in Arabic, but in Naima's workshop it stands for "Hips, Execution, Layering, Walking, and Attitude." She will share techniques for stronger body awareness, choreography, stage presence, and much more. Learn more at the Facebook event. Click here to pre-register. Jendayi Bellydance Presents "Fractured Fairy Tales"
Don't miss this chance to see your beloved childhood stories deconstructed using the language of raqs sharqi! Jendayi welcomes dancers from throughout the metro area showcasing some of the most creative theatrical belly dance you'll see this year. Click here to get your tickets; visit the Facebook event for more info. 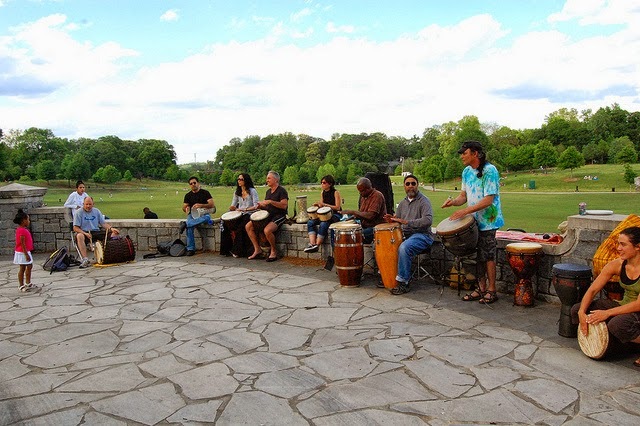 Local drummer Danny Stern once again invites percussionists and dancers to Piedmont Park on Sunday afternoons for free drumming and dancing! This Sunday, March 15th, join Danny in welcoming Spring, 3:00 p.m. until dark at the curved wall on the top of the hill near 10th street, facing the meadow. This drum circle should be happening every Sunday throughout the spring and summer! Get out and support your community as we welcome spring in belly dance style! Practice 6:30 - 7:30 p.m. This year's Shimmy Mob will happen on May 9. Check out what Shimmy Mob is all about in this free practice session at Global Dance! Afterwards, enjoy a casual hafla/meet-and-greet with your fellow dancers and members of Atlanta SEEDs. Learn a new choreography that will be performed at GLOW's April 18th Anniversary Hafla. Click here to learn more and buy advance passes. Shimmy Mob choreography practice followed by a belly dance video viewing party! Join local raqs star Aziza Nawal for her annual show at Nicola's. Enjoy performances by soloists from Troupe Mumtaz, group performances by Banat Nawal, and guaranteed fun with Aziza and Nicola. RSVP to the Facebook event for all the latest info. Shimmy Mob choreography practice followed by a sponsored "shimmy off" contest! Learn new techniques for two popular props with metro Atlanta's own Jaki Hawthorne. Double Fan Veils: 10:00 a.m. - 12:00 p.m.
Tahtib (stick): 1:00 p.m. - 3:00 p.m. Enjoy a glass of wine (to benefit the SEEDS program) and performances by lots of local favorites, including workshop instructor Jaki of Tarabiya. Visit the Facebook event for the full lineup and all the latest info. Polish up your Salimpour technique with two classes led by Yvonne, who wowed us at the Suhaila Raws Showcase in January. Visit the Facebook event to learn more, or click here to pre-register. Students build on the knowledge and skills from Level 1 by focusing on precision, efficiency and fluidity of movement. More layering is addressed through the addition of finger cymbals as well as more intricate arm and foot patterns. Doors at 6:00 p.m.; show begins at 6:30 p.m. Enjoy performances by students, troupe members, and instructors at Nazeem Allayl's semi-annual showcase. Plus great food and fun with Nicola! Click here to learn more and get advance tickets. Show your love for belly dance and our amazing raqs community by getting out and attending one of the events coming up in February! One of metro Atlanta's most accomplished performers, Karmelita, shares several of her skills with us Click here for tickets. Visit the Facebook event for more info. in these workshops! 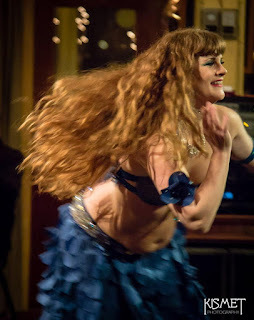 Learn an intermediate-level Orientale choreography (I've heard it will be to John Bilezikjian version of "Lamma Bada," and that you should bring a veil), then get some of Karmelita's pinup-style makeup secrets while enjoying an adult beverage or two! Saturday: dance workshops with Kay and Uza at Atlanta Fusion Belly Dance, followed by live music show at Steve's Live Music, 9:00 p.m.
Get ready to clap your hands, swing your hair, swish your thobe, and brandish your daggers with a weekend of Khaliji and Iraqi dance, featuring two instructors with deep knowledge of these dance forms, Kay Hardy-Campbell and Uza Mitra. RSVP to the Facebook event for more details, or visit the web site for lots more info and to buy tickets. Enjoy a wine tasting at noon, then learn a choreography to a new version of "Crazy in Love" from the "Fifty Shades of Grey" soundtrack. Visit the Facebook event for more info. Learn a sassy choreography to "When You're Good to Mama" as performed by Queen Latifah in the movie version of "Chicago." Visit the web site for more details and to buy your pass. Request one of your favorite songs from the Nazeem Allayl class playlists and take the floor in a casual hafla setting. Visit the web site to learn more. 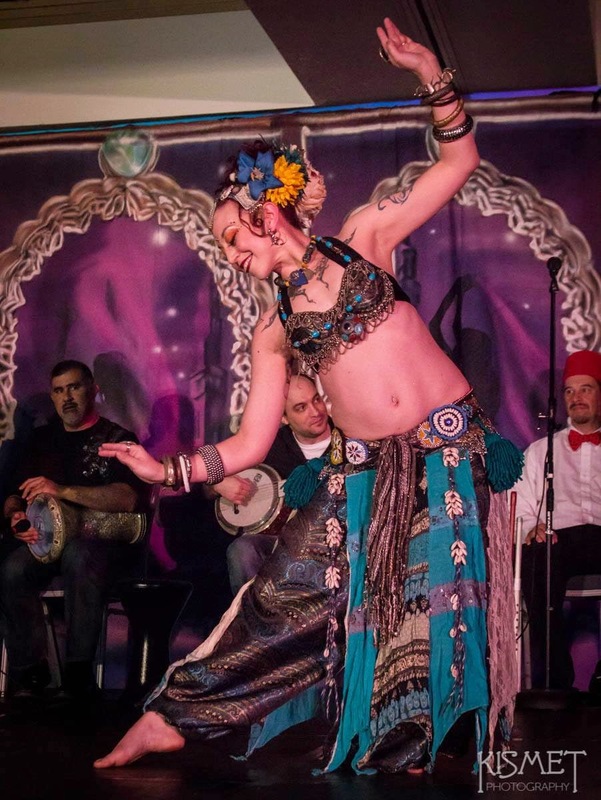 Friday and Saturday night at Imperial Fez, enjoy special menu selections, a fresh rose, and an awesome belly dance show featuring local favorites, including Zaina, Kalinka, Karmelita, and Omega. Visit the restaurant's web site or Facebook page for more details and to make reservations. Come out and party with World Belly Dance Alliance at Steve's Live Music in Sandy Springs! 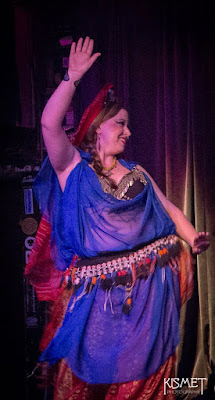 This month's event will be more of a hafla featuring live music and and open dance floor. Experience the joy of dancing to live music and get warmed up for the parties at TribalCon! Learn a brand-new Turkish-style choreography to a big hit by Tarkan. Visit the web site for more info and to pre-register. 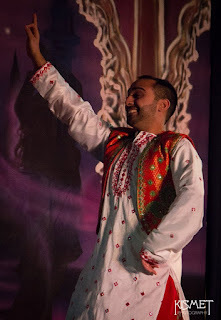 Learn a fun Bollywood-style choreography to a popular Indian song, and get ready to perform in Nazeem Allayl's spring student show. Click here for more information about the choreography. Visit the web site to pre-register. year. This year's theme is "The Next Generation," featuring dance workshops with Donna Mejia, Heather Stants, Bagoas, Alyssum Pohl, and Lacey Sanchez... and music classes with Doug Adamz of Light Rain, Al Cofrin of Istanpitta Early Music Ensemble and Terebus; Carmine Guide of Djinn; and Majda Anwar of Alla-Yustur. One of the distinctive elements of TribalCon is its focus on education as well as music and movement classes. This year's event will kick off with a lecture and discussion featuring Donna Mejia on Thursday evening, followed by classes with Madame Onca, Amanda Mahde of Ananda Dance Company, your hostess Ziah, and many of the music and dance instructors. Learn more about the business side of belly dance, stage management, choreography, and much more as these talented people share their knowledge. Two shows, both featuring live music and followed by live music dance parties... visit the web site to learn more and get tickets. Visit the TribalCon web site for more details and to get your workshop passes or show tickets.